A takeaway trickster who allegedly conned a cashier into giving him more change by using sleight of hand could have scammed thousands of pounds out of local businesses. That’s the opinion of Sir Alex Ferguson’s personal magician, Andrew Green, from Preston, who says the man’s confidence suggests he’s not a one-trick pony. Now the takeaway owners are warning other businesses not to be duped. The man can be seen on CCTV at Barton Takeaway, sliding a £10 note up his sleeve before presenting a £5 note and demanding more change. The unsuspecting cashier hands the money over and although it may appear the man gains only £5, Andrew believes he could be conning businesses all over Lancashire. Andrew, who has spent 20 years in the illusion business and performs at Sir Alex’s private parties, says the man uses “distraction and confidence” to trick his victim. He was being quite rude and awkward with his order too and when he’d gone I thought I’d check the CCTV to see if anything had happened. He said: “The first thing I noticed when watching the video is that the man who performs the trick really looks like he’s practised too because he does it with such ease. “That, however, doesn’t necessarily mean he’s a magician. “Another key point is his confidence and his mannerisms. “He doesn’t look like he’s got away with something, despite having an audience. 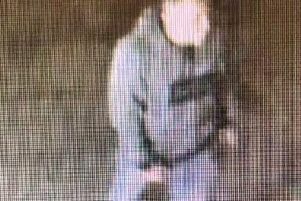 Barton takeaway CCTV showing images of man conning the cashier into giving him more change. Andrew believes all this adds up to the man being a serial conman who could have scammed thousands of pounds from small businesses. The manager of the Barton takeaway, Jen Law, agrees and hopes by releasing the footage other local businesses can be warned. “We thought the man was acting suspiciously when he came in,” he said. “He was being quite rude and awkward with his order too and when he’d gone I thought I’d check the CCTV to see if anything had happened. “It was then I saw that we’d be conned and because he looked so practised I have no doubts that he’s done it to other businesses. The incident happened at around 5.45pm on November 2 and police say they are aware of the footage.